Do you have a special project in metal or wood that requires imagination and professional skills to build? ArcTyp Studios can build custom gates, comissioned art, fine outdoor furniture and many types of custom metal, stone and wood work. Metal fabrication, fine carpentry and precision engineering are my hallmarks. I also specialize in metal spraying, a process that can coat existing objects in metal or form complex 3D shapes from molds. ArcTyp functions as your personal designer and fabricator, with an emphasis on custom metal work and lots of creativity. We work collaboratively with you to design practical solutions that add beauty to your home or business. Blending the best aspects of artists, carpenters and welders and machinists, We help you envision, refine and create ideas that you can't find in a store or catalog. 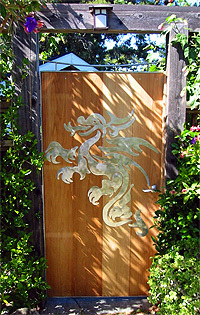 See the portfolio page for some examples, such as the Dragon Gates in Tiburon. Call or email us for fresh ideas that add fun and value to your life. Enthusiastic references available!